Talked to my son (trucker) and he said cat uses air pressure to enguage the fan clutch. I believe your car is working correctly if it doesn't run hot. A 603 doesn't use air pressure to engage the clutch. Testing it is easy. Per the service manual, in park hold the engine rpms at 2800-3000 RPM. When the coolant gets around 80*C the fan clutch should engage. You'll know, the fan will start roaring. If it doesn't the clutch is bad. Actually the specification is coolant temps of 90- 95C in order to provide the 71C air flowing through the radiator that can alter the viscous clutch's bi-metallic strip's shape enough to activate the valve which in turn allows the silicon fluid to flow from its storage chamber into its working chamber thereby engaging the fan. At an 80C coolant temp the fan/clutch should not be engaged. It will still be rotating but it will not be engaged and its speed will be 1000 rpm or less. The FSM actually states " Run the engine at 4000-5000 rpm, Once the coolant temp of approx.90-95C has been reached, the speed of the viscous fan couplingmust increase, which can be clearly heard." 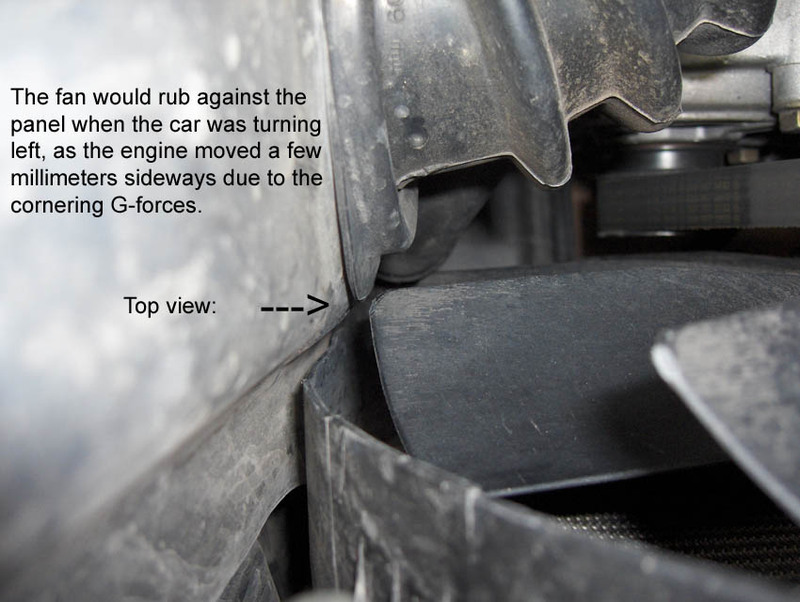 "When the coupling is engaged, fan speed increases proportionally with increasing engine speed in the lower RPM range, without exceeding 3300 rpm in the upper range"
In the OP's earlier post he mentioned that the fan appeared to wobble, that would possibly indicate the failure of the clutch's center bearing which could ultimately allow the clutch and/or fan to separate with great potential damage to the surrounding radiator/serpentine belt drive/vacuum pump/etc. Absolutely, particularly with the original aluminum blades! Brittle, heavy, hard, and moving fast never a good situation! It is the bearing. Not only can I move it east and west I also discover that I can move it in and out on the hub needless to say it is parked till the clutch arrives. Next question. Should I do the fan as well? It is original too. I know there is an upgrade or direct drop in from a 606? Has anyone done this? ok so I was not convinced but just now looked at mine and ITS solid on the bearing! no movement at all other than spinning free as the car is COLD! I had a 73 caddy coupe once that had no clutch at all and that baby ROARED but it was cooling a 500 C.I. engine! 74 450 SE on the way out! Recent: 1972 Toronado 56k on the clock! The favored upgrade is a 98-99 606 clutch with its 11 bladed plastic fan. It's a direct bolt on to the water pump pulley. I don't have a link but it has been mentioned in other threads that this clutch has an activation temp point that may be lower than the 300SDL original spec, I don't see how that could be any disadvantage. On some 603 powered vehicles, 124s I think the shroud may need some minor mod, sixto has mentioned this when he did this upgrade to a car he had. There has been some discussion regarding using the original fan on the upgrade clutch, fits for some people others have problems. I can't see any advantage to the aluminum fan and no disadvantage to the 11 blade plastic fan so I always go that way. The harbor freight pulley holder tool turns this fan/clutch R&R from a hassle into a minor inconvienience, blue threadlock on the cap screw fastening the clutch in place, and remember to get the shroud into place over/around the fan/clutch when you install or the first time without it and just the fan/clutch will be your practice run! I've never had an MB or anything else for that matter whose mechanical fan did not turn at all times unless it was mechanically blocked from doing so. If I had a clutch that allowed the fan to sit dead still while the engine was running, I would be very doubtful of its ability to engage sufficiently to cool the engine when needed. I MUCH prefer too much engagement to too little --- I don't ever change these things when/if they get to where they spin too much; the only time I've ever replaced them was when they freewheeled so much cold that they were clearly shot. I don't deny that some engines are so lightly coupled to their fans that it might stay stopped after being blocked with newspaper, but... frankly, I wouldn't *want* mine to do this, and I've never seen it happen. I'm using the 606 parts on mine with no trouble. Thought they did away with the aluminum fan with the 617 engine --- my SDL came, as far as I know, with a 9 blade plastic fan that I upgraded to an 11 blade. my 87's all have aluminum fans. Parts ordered will be here tues (thanks Phil). Made a fan bolt removal tool, will make sure it will work before I weld it in place. Will be hitting the harbor freight for the serpentine belt holder. Will try to post pics later in the week. My 91 had an aluminum fanwheel too. Got swapped out for a plastic fanwheel when I changed the clutch. How on earth do you hold the fan in place to re attach it to the water pump I am running out of arms to do this. Is there a trick to get it started?